Before deriving the equation of the concave lens, first understood the sign rules of the concave lens. The following are the sign rules of the concave lens. If the object is on the side of the lens that is the same as the direction of the beam of light, then the object distance is positive. If a beam of light passes the image, then the image distance is positive (real image). If the image does not pass through the beam of light, the image distance is negative (virtual image). If the focal point of the lens is passed through a beam of light, the focal length of the lens is positive. Conversely, if the lens’s focal point is not passed by light, the lens’s focal length is negative. The focal point of the concave lens is not passed by light, so the focal length of the concave lens is negative. If the object is above the principal axis, the height of the object is signed positive (object is upright). Conversely, if the object is below the principal axis, the height of the object is negative (object is inverted). If the image is above the principal axis, the image height is positive (image is upright). If the image is below the principal axis, the image height is negative (image is inverted). If the magnification of image > 1 then the image size is greater than the object size. If the magnification of image = 1 then the image size is equal to the object size. If the magnification of image < 1, the image size is smaller than the object size. 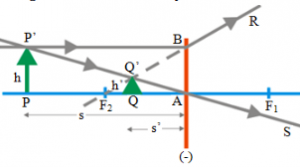 Based on the figure below, two beams of light are drawn towards the concave lens, and the concave lens refracts the light beam. 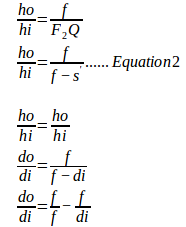 s = do = the object distance, s’ = di = the image distance, h = P P’ = the height of object, h’ = Q Q’ = the height of image, F1 and F2 = the focal point of the concave lens.